Rising numbers of secondary school pupil exclusions have prompted Ofsted to write to head teachers. Eight out of the 10 areas with the highest exclusion rates in England are in the North East and Yorkshire and the Humber, latest figures show. Cathy Kirby, regional Ofsted inspector for these areas, said schools should only use exclusion as a "last resort". 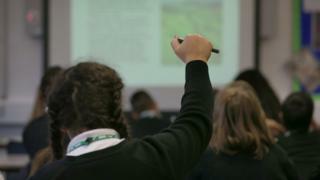 The National Association of Head Teachers (NAHT) said schools need more support for troubled students. Ms Kirby said it was difficult to explain why the figures, from 2015/16, show certain geographical areas had higher rates of exclusion than other parts of the country. Middlesbrough, Barnsley, Redcar and Cleveland, Doncaster, North Lincolnshire, Rotherham, Sheffield and North East Lincolnshire among the top 10 areas with highest secondary school exclusion rates. A fixed-term exclusion can be anything from part of a day to a maximum of 45 days within a single academic year. Ms Kirby is calling on her inspectors to look carefully at a school's use of exclusion when making judgements about its leadership and management and pupils' behaviour. She will write to head teachers to express concern over the numbers of secondary school pupils being excluded. But Paul Whiteman, general secretary of the NAHT, said exclusion of a student was "never taken lightly and always as a last resort". "This is an area where prevention is better than cure but school budgets are at breaking point so many of the measures that schools take to ensure good behaviour and adequate support for pupils are under threat," he said. "Schools can't do it on their own. To avoid exclusions, they need support from the other local services around them. "The issues that underpin exclusions reach far beyond the school gates, so schools need access to expert resources to help them identify at an early stage those students who need more help." Ms Kirby's comments come after Ofsted chief inspector Amanda Spielman's annual report, which said that she supports a school's right to exclude pupils, but that it must only be used when behaviour is violent, threatening towards teachers or when it affects other pupils' learning. Middlesbrough Council, the authority which had the highest number of exclusions in 2015/16, said it only deals with permanent exclusions rather than fixed-term ones. A spokesperson said: "Since December 2016, the local authority has been working with schools to implement models of intervention and establish alternative pathways for pupils at risk of permanent exclusion. "Through that proactive approach working with schools, of which six of the seven secondary schools in Middlesbrough are academies and not under local authority control, we were able to reduce that in 2016-17 by more than half to 36."